Christchurch, New Zealand, is close to a number of active faults, and so is an area of moderate to high seismic risk. As part of the seismic hazard assessment and upgrade of the Catholic Cathedral of the Blessed Sacrament, non-destructive, non-invasive ground penetrating radar (GPR) profiles were acquired to examine the structure and depth of the cathedral foundations. The GPR surveys delineated a structure that runs the length of the central aisle, which correlates with the position of an infilled trench where a wagon carriageway was located during construction. The surveys also delineated a very shallow feature in the middle of the nave, which may be associated with the under-floor heating system. Unfortunately, the GPR surveys did not detect the presence of significant or extensive building foundations. The surveys could not be run at or immediately adjacent to the interior pillars or the exterior walls, which thus suggests that any foundations are restricted to the narrow areas beneath the pillars and the walls, and do not extend any significant distance out beneath the cathedral floors. The Catholic Cathedral of the Blessed Sacrament is located in the southeast quadrant of central Christchurch, New Zealand. 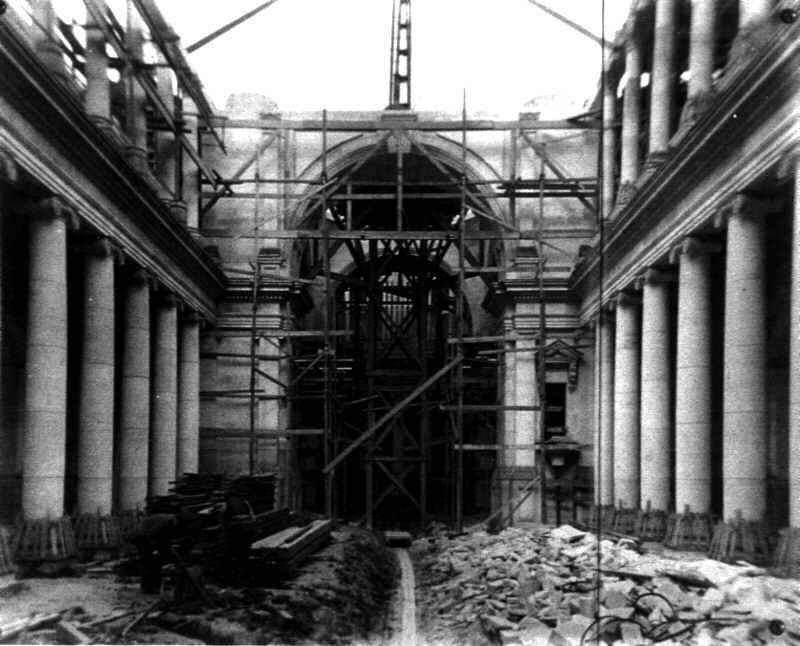 Construction of the Cathedral began in 1901, and the Cathedral was opened in February 1905. The Cathedral is 64 m long and 32 m wide, and the main dome is 41 m high (Figure 1). The sediments underlying the Cathedral site are recent (Holocene) stream and swamp muds and peats underlain by interbedded gravels and marine silts. Such sediments are susceptible to enhanced shaking and liquefaction during an earthquake. Christchurch is located in a seismically active area (Elder et al. ), near many active faults (Figure 2), and thus the Cathedral may be at risk if a seismic event occurs. To that end, therefore, a programme was initiated to bring the seismic strengthening of the Cathedral up to modern building safety standards. 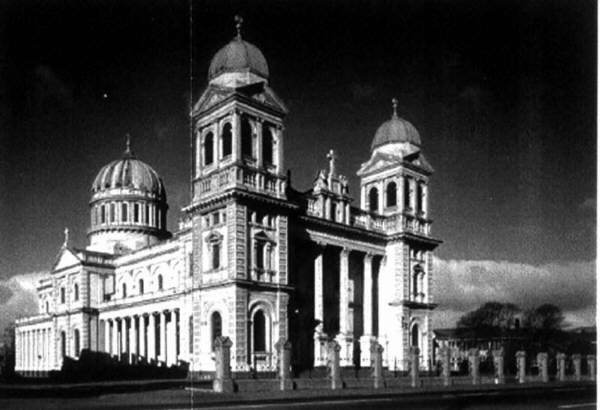 Fig 1: The Catholic Cathedral of the Blessed Sacrament is located in south-central Christchurch, New Zealand, which is underlain by soft sediments. Fig 2: Christchurch is located near a number of active faults (from Brown & Weeber, 1992). Before such a programme could begin, however, questions regarding the nature and extent of the foundations of the Cathedral needed to be addressed. From its beginning, cracks appeared due to settling of the Cathedral, and rising damp was and is apparent in some of the support pillars, suggesting that the foundations are shallow and limited in extent. Historical research yields little direct information on the Cathedral foundations (Lyons, 2000). A number of test pits and cone penetrometer tests (CPTs) were done outside the Cathedral, and indicated that it was in a zone of high lquefaction potential (Guilhem and Berrill, 1993). However, test pits and CPTs are (1) invasive, (2) costly, and (3) point samples, and did not cover the target. Therefore, a suite of near-surface geophysical surveys were carried out, particularly ground penetrating radar (GPR). GPR involves the propagation of a pulse of radar energy directed into the ground from a transmitting antenna. Echoes from subsurface physical property changes return to a receiving antenna. Such changes occur for various reasons, but especially because of changes in water content. The reflected radar energy is recorded as a function of two-way travel-time (TWT), in nanoseconds (ns). The reflection records, or traces, from each measurement location are plotted one next to the other in a radar profile, which is akin to a cross-section of the subsurface. Davis and Annan (1989) describe GPR concepts and fundamentals in more detail. GPR is widely used for a variety of applications. The GPR surveys were run using two complementary systems: a Sensors & Software pulseEKKOTM 100 (pE 100) system using 200 MHz antennas; and an ERA broadband high-frequency system (200 - 2,000 MHz). For brevity, only the pE 100 results are presented here. 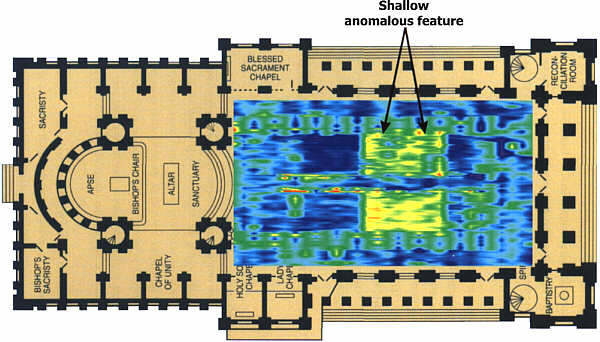 The pE 100 survey lines covered the floor of the nave of the Cathedral (Figure 3). The spacing between transmitting and receiving antennas was fixed at 0.56 m. The survey lines were spaced every 1.1 m, in order to accommodate the spacing and dimensions of the support pillars. Readings were acquired every 5 cm along each survey line. The surveys were acquired in two orientations, because reflections can originate from features that are oriented parallel and perpendicular to the survey lines (Nobes and Annan, 2000). The two data sets were then combined to yield a more complete response. In addition, the radar antennas were stepped out from a central survey point, a common mid-point (CMP) survey, at selected locations in the cathedral in order to determine the radar velocity as a function of depth and to ioslate the above ground features that may cause reflections of radar waves through the air. 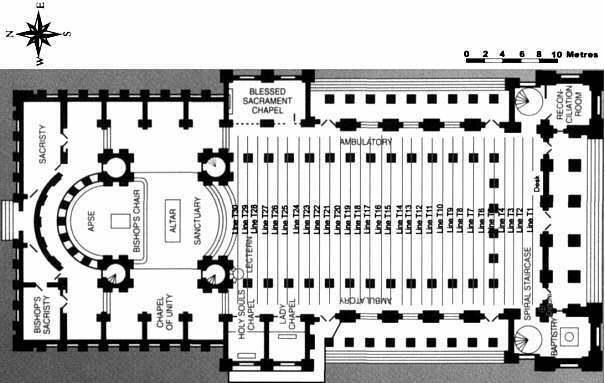 Fig 3: Layout of the GPR survey lines across the nave of the Cathedral. Two antenna orientations were used to obtain reflections from the two dominat orientations, and the data were then combined to yield a more complete representation of the GPR response. (Adapted from pamphlet of the Cathedral of the Blessed Sacrament, Christchurch.). Once the profiles are collected, the data are corrected for "wow" - the saturation of the receiving antenna with time - and are migrated. Migration is a process which collapses subsurface diffractions - i.e. scattering from discrete features - and which places dipping features in their correct positions. Basic seismic and radar propagation theory is based initially on horizontal layering; dipping features are steeper than they appear in the raw profiles. Finally, the closely-spaced profiles are collected together to form a three-dimensional (3D) data cube, which can be "sliced" in different orientations, including at specific times which are equivalent to different depths once corrected for the radar propagation velocity. Analyses of CMP's (Figure 4) and subsurface diffractions in the radar profiles yielded subsurface velocities ranging from 50 to 80 m/ms, values that are characteristic of saturated soils (e.g., Davis and Annan, 1989). Concrete, in contrast, has radar velocities of the order of 120 to 140 m/ms. The velocity results, coupled with the radar cross-section profiles, suggest that the cathedral foundations consist of, at best, compacted soils. 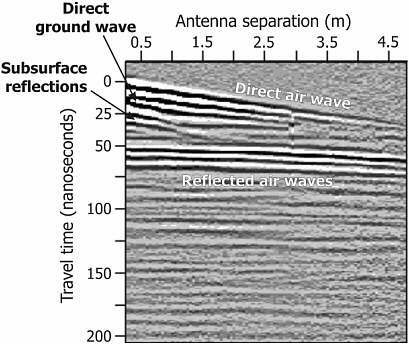 Fig 4: Example of a common midpoint (CMP) record, showing the direct air wave, direct ground wave, and reflection events from the ceiling and walls ("Reflected air waves") and from the subsurface. The only significant features that occur at any depth are shown in Figures 5 and 6. One shallow feature (Figure 5) may be associated with the underfloor heating installed in recent decades, or with some other feature of the earlier construction phase. The heating is thought by Cathedral staff to be limited in extent, which correlates well with GPR results. The other shallow feature (Figure 6) is an intriguing linear feature that extends the length of the nave. It may be associated with the central aisle of the Cathedral, but could also be due to an infilled trench that contained a carriageway for transporting material within the Cathedral (Figure 7). Fig 5: Shallow feature at about 19 ns. The anomalous response may be related to some aspect of the underfloor heating or may be a residual of the construction process. Note the presence of a central aisle feature, which is better isolated at other time-depths, as shown in Figure 6. Fig 6: The central anomalous "aisle" feature appears at a range of shallow time-depths, as shown here for 10 ns. The feature may be associated with the carriageway (Figure 7) used to transport building materials through the Cathedral. Note the response from the ceiling above the ambulatory by the main entry at the south end (right-hand side). Fig 7: The central linear feature that is dominant in the GPR results correlates well both with the central aisle and with the in filled trench associated with the carriageway that was used to transport materials in and rubbish out during the Cathedral construction. (From O'Neill, .1994.). The combination of the CMP velocities and the lack of an extensive reflective feature at depth beneath the central main part of the Cathedral suggests that there is no solid foundation to the Cathedral. This is supported by qualitative observations within the Cathedral: rising damp in the pillars; cracks in the walls, especially on the mezzanine level, which have continued to appear throughout the life of the Cathedral; the shaking felt in the Cathedral due to heavy traffic on nearby roads. Complementary cone-penetrometer tests (CPT's) and GPR profiles and CMP's were acquired outside the Cathedral. The CPT and GPR results correlated well, confirming previous studies in the area and previously identified sediment types. 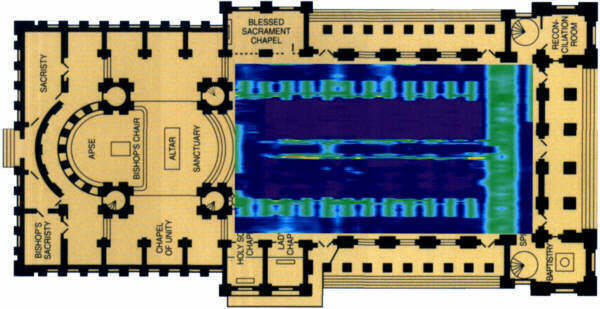 The agreement between the two approaches provide greater confidence in the GPR results inside the Cathedral. Ground penetrating radar surveys were completed as part of the programme of seismic strength assessment and upgrade of the Cathedral of the Blessed Sacrament in Christchurch, New Zealand. The GPR results suggest that the Cathedral has, at best, a compacted soil foundation, and lacks a solid constructed foundation, as is needed in this area of high seismic risk. The results correlate well with both quantitative studies immediately surrounding the Cathedral and qualitative observations of conditions within the Cathedral. The seismic strengthening has now entered the next phase. We thank Professor John Berrill, of the Department of Civil Engineering at the University of Canterbury, for asking us to participate in this project, and to Dr Julian Tealby, of the Department of Electrical and Electronic Engineering, for the use of his ERA system. Thanks also go to Father Bill and to Cathedral volunteers Betty and Mary for their patience with our disruption of their routines, including the shifting of 432 metal folding chairs out from and back onto the main floor of the Cathedral. Finally, our thanks to all of our field assistants, too numerous to mention. L. J. Brown and J. H. Weeber, 1992. Geology of the Christchurch Urban Area. Institute of Geological and Nuclear Sciences, Lower Hutt, New Zealand, Map No. 4. 104 pp. J. L. Davis and A. P. Annan, 1989. Ground penetrating radar for high resolution mapping of soil and rock stratigraphy, Geophysical Prospecting, 37: 531-551. D. McG. Elder, M. D. Yetton and L. T. McCahan, 1991. Christchurch: The earthquake hazard. Soils & Foundations, Ltd., Christchurch. Unpublished Report prepared for the Earthquake and War Damages Commission (EQC), Wellington. 290 pp. O. Guilhem and J. Berrill, 1993. Cone penetrometer results and estimate of liquefaction potential at some key Christchurch lifeline sites. Department of Civil Engineering, University of Canterbury, Unpublished Report. 51 pp. C. Lyons, 2000. Foundation investigation for the Cathedral of the Blessed Sacrament, Christchurch, New Zealand. Department of Civil Engineering, University of Canterbury, Unpublished Report. D. C. Nobes and A. P. Annan, 2000. "Broadside"vs "end-fire" radar response: Some simple illustrative examples. In D. A. Noon, G. F. Stickley and D. Longstaff (eds), GPR 2000: Proceedings of the 8th International Conference on Ground Penetrating Radar, SPIE Vol. 4084: 696-701. D. C. Nobes and B. Lintott, 2000. Rutherford's "Old Tin Shed": Mapping the foundations of a Victorian-age lecture hall. In D. A. Noon, G. F. Stickley and D. Longstaff (eds), GPR 2000: Proceedings of the 8th International Conference on Ground Penetrating Radar, SPIE Vol.4084: 887-892. H. O'Neill, 1994. The Cathedral of the Blessed Sacrament, Christchurch, New Zealand. Art for Art Print, Christchurch, New Zealand.